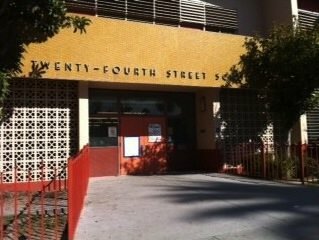 By the first of the new year, 24th Street Elementary School in West Adams will open a new pre-kindergarten program, a victory for parents concerned with how children were performing in grades beyond. The change came about through California’s new Parent Empowerment Act, the so-called Parent Trigger Law, which lets parents implement changes that include replacing staff, adding programs, shutting down the school altogether and handing control over to a charter. The law has been used in a small number of schools this year, drawing controversy in each case for its impact on union teachers and the parents of students who did not sign petitions seeking change. Efforts for change at 24th Street began several years ago. Parent Maria Eloisa Alcala said the school was functioning poorly on a number of levels, with bathrooms that weren’t working properly, rats found in vents and, worse, low student achievement. “Children at 24th were performing way below grade level,” said Alcala, who has two kids at the school. Children were testing badly, she adds, in both reading and math. For that reason, she said, parents decided a pre-K program could make a difference. The school’s previous pre-K program was one of more than a dozen that the district had closed because of budget cuts. Alcala, who was heavily involved in the effort to add a pre-K, said that despite ample research showing the benefits of early education for kids, there were no other pre-K programs in the area. “We really made clear that we wanted pre-kindergarten,” she said. With the help of Parent Revolution, about 50 parents collected signatures on a petition to return pre-K to 24th Street. Last January, they gave the petition to LA Unified officials, and after a lengthy discussions with with a number of suitors, they handed the reins of the pre-K over to a local program called LA Up. Now, as officials prepare to open to the program, over 90 kids – mostly around age three – are on a waiting list. Parents aren’t yet sure how many will be admitted, but are pleased with the amount of interest in the program.